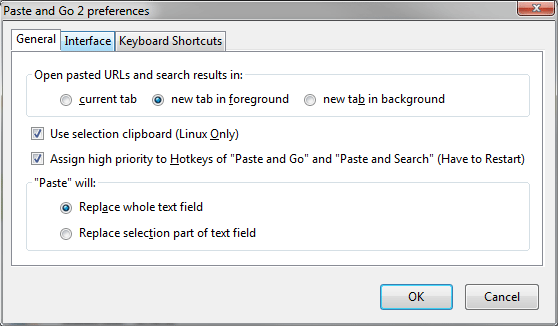 This simple Firefox extension provides a configurable keyboard shortcut which will instantly paste and go (open or search) whatever is in the clipboard. It is a great time saver. Unfortunately the extension seems to have been abandoned by its developer and has been removed from Mozilla’s addons website, making it very difficult to download it. As I find it very useful, I’ve put it here for people to download. It will report that it is incompatible with the latest versions of Firefox, but it seems to work just fine (on Firefox 32 at the moment). 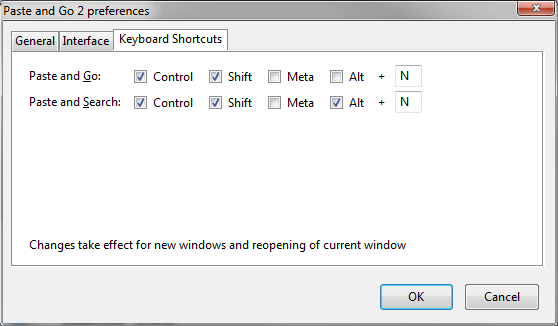 Personally, I used to use Maxthon which had this feature built-in, so I use this extension purely to provide a keyboard shortcut. I disable all of the interface. You can see my settings in the pictures below. Here are what my settings look like. 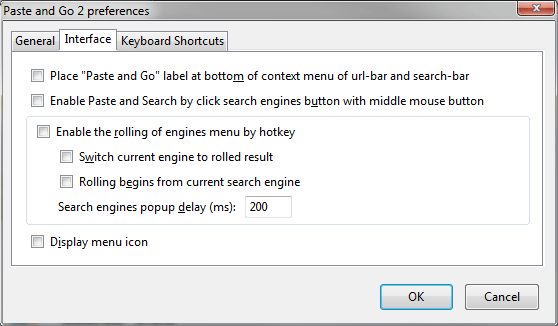 Note that you may have to enable “Assign high priority to Hotkeys…” if your chosen hotkey is already used by Firefox or another extension. “Actually I didn’t make it from the scratch, I just update it to make it work with Mozilla Firefox 3.x.x and it’s working fine (this release will work on Firefox 1.5 to 3.x.x). Here I’ll try to show you how the extension will ease the use of Mozilla Firefox. Most of the time while we surf the internet, we have to copy some URL and paste the URL on the address field and hit enter or click the go button. Now this extension for Firefox will ease the the whole process. You have to copy an URL, right click on the address field and select “Paste and Go” That’s it! 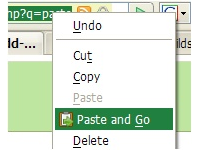 You can now download paste and go 3 1.0.5 from this site. Otherwise the instructions below, while outdated, are still roughly correct. The installation instructions below mostly no longer apply, but I have left them here for historical reasons. You will probably be presented with a security warning something like the below, as nothing is signed or trusted here. Currently Mozilla left the extension as experimental extension, so you have to check the box “Let me install this experimental add-on” to add this extension on your Firefox browser. You can also download the extension by clicking here. After restarting Firefox, you will see a notification that one extension is installed. Close the window and continue using Firefox. Now whenever you need to copy an URL and paste it on the address bar, just copy the URL and right click on the address bar and select paste and go. Display Published Date In Google Search ResultsDisplay the Date a Web Page Was Published in Google’s Search ResultsImprove Advanced Custom Fields Relationship And Post Object Fields SearchHow to get the ACF Relationship and Post Object fields to sort by search results relevance, only show published posts, search by URL, and exclude the current pageFord Falcon BA-BF Custom Carputer GuideHow to build and install a car pc or car computer in a BA or BF Ford FalconHow To Clean A BA Ford Falcon Cabin Air FilterIs your Ford Falcon air conditioning or heating not blowing as much air as it used to? Have you cleaned your cabin air filter recently? Here’s how.Correcting Clock Drift On A CentOS VM Under Hyper-V On Server 2008 R2How to correct clock drift on a CentOS 5 virtual machine guest running on a Server 2008 R2 Hyper-V host.Delete Contacts From Android And Resync From ExchangeHow to delete duplicated contacts in Android and resync them from Exchange, and fix the synckey issue when Exchange won’t resync the contacts.Delete Comment Spam From GalleryHow to mass delete comment spam from GalleryEnable EPG TV Guide In Media CenterHow to enable the Electronic Program Guide for TV broadcasts in Vista or XP Media Center for use in Australia.Exchange Management Console Permissions GoneHow to correct error “you don't have sufficient permissions to view this data” from the Exchange Management Console Organisation ConfigurationSend An Email To All Group Managers Via A Reactive Rule In Drupal 7The idea was that when someone signed up and requested to join a group, the administrators (not just the author) of that group would get an email letting them know someone had requested access.Hotlink ProtectionHow to protect files from hotlinkingPrevent Caching Of Dynamic Web PagesHow to prevent caching of web pages using PHP.Get An External USB Audio DAC Working On Raspberry PiYou are using a USB Audio DAC on a Raspberry Pi, and it does not work properly.Reset The Desktop Windows Manager In WindowsHow to reset the Desktop Windows Manager in Windows.Soundblaster Live ASIO SupportHow to use a Soundblaster Live with APS drivers to provide ASIO supportTemplate-Based SiteMake a simple PHP-based template-drive siteIntel Wi-Fi: Unsupported (too Old) EEPROMHow to determine that you have bought an “engineering sample” version of an Intel Wi-Fi card.Useful Linux CommandsA little list of basic commands I keep needing, but which I don’t use often enough to bother remembering. It’s basically an online sticky note. These are specific to CentOS.How To Fix Windows Live Messenger For Mobile ProblemsHow to fix Windows Live Messenger for Mobile problems.Bypass PHP Output Buffering When Using Apache Mod_deflateHow to output content immediately to the browser by bypassing PHP’s output buffering using flush() & ob_flush() while still using Apache mod_deflate to compress page contents.